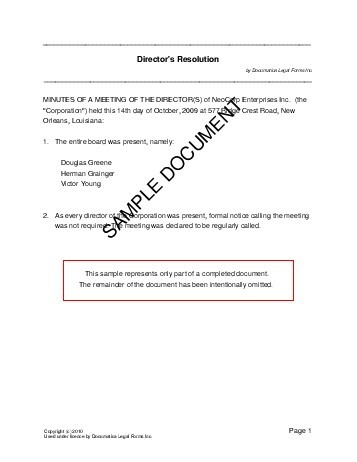 A Director's Resolution is used to document the minutes of a meeting between the Board of Directors of a corporation or other organization, and formally state the resolutions and outcomes of the meeting in writing. The resolutions can be stated as if they were presented in a meeting (ie, in the minutes) or separately as a document outlining only the resolutions (may be certified or un-certified). Do you wish to state the resolutions as the minutes of a director's meeting? A certified corporate resolution has been verified and approved by the Secretary and President of the corporation. Do you wish for this document to be a certified corporate resolution? How many directors are/were present? Is this all of the directors? How many directors are/were absent? How many directors does the corporation have? How many resolutions are being passed? Describe the resolutions in complete sentences, and provide as much detail as possible. When will the resolutions become effective? When will this document be signed? We strongly recommend obtaining an attorney reviewed Directors Resolution directly from us. Below are some random samples we have created with Documatica. Please note that these documents reflect a certain set of answers, and it is very likely that the document you require is different. Do not rely on the templates below - create your own customized Directors Resolution with our webpage. For maximum legal protection, obtain a lawyer reviewed Directors Resolution directly from us.